This Valentine's Day, I'm going to attend the Two of Hearts Boutique grand opening and then catch an afternoon matinee of He's Just Not That Into You by myself, fashionable and fabulous single gal that I am. You ask yourself, how are these two things related? Well, you see, if I were celebrating Valentine's Day with a boyfriend, this Betsey Johnson mesh bow watch ($95) from Urban Outfitters would rank high on my list of desirable gifts from said beau. I'm too clumsy with watches to splurge on one myself and I'm trying to keep an eye on my spending after the new shoes and camera, but (ahem) I wouldn't say no if this watch were given to me. More jewelry statement than pragmatic timepiece, I love how the bow takes centre stage and the watch face dangles off to the side. The contrasting gold textures--polished metal, fine mesh, metallic leather--give the entire piece a luxe vibe and set it apart from the pack. It would be the perfect finishing touch for an LBD and kitten heels--the sort of thing Blair Waldorf or Audrey Hepburn would wear for a candlelit dinner with her tall, dark, and handsome leading man. How are you spending this Valentine's Day? I SO agree. What a fun take on a practical item. Awwww, that watch are soo cute. (I think everything with bows are cute, hehe). 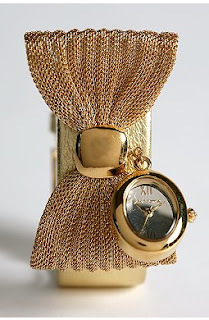 Hmm I've never been one for watches but that certainly is an interesting and very pretty item. You wouldn't misplace it that's for sure! Oh my gosh, what a find. Love it. The boy will probably make me dinner--he's a great cook. Oh wow! I've been trying to figure out how to wear bows without looking like Mickey Mouse and this watch is perfect!! I might have to run over to UO and get it!! Thanks for sharing lovely!! It'll be perfect for my V-day...which is going to be a surprise, which is nice but so tricky when it comes to outfit decisions!! Your Valentine's Day sounds awesome! I don't have any plans as of yet, but I'm hoping it will involve the bf - hahaha! The bow doesn't really thrill me as I think it would overwhelm small wrists, but I do like how unique it is with the watchface dangling like a charm on the side. We are still going together to the sale right? 1 please! I don't like wearing watch and often use my cellphone to check the time but this is just gorgeous and it looks more like a cuff than a watch. love it!